The comprehensive Dental blog 'Somani Dental Care' by Simi Valley Dentist DDS Somani, includes details about the dental diseases, dental treatments, dental precautions and practices should be carried on for healthy gums and teeth. The blog aims to update the community with latest updates in the dentistry section as well as to educate them to take proper care of their gums and teeth. This what your Somani Dental Care Blog Ad will look like to visitors! Of course you will want to use keywords and ad targeting to get the most out of your ad campaign! So purchase an ad space today before there all gone! 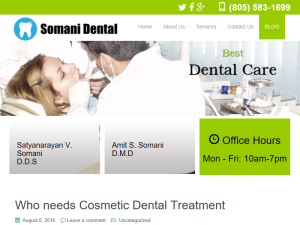 If you are the owner of Somani Dental Care, or someone who enjoys this blog why not upgrade it to a Featured Listing or Permanent Listing?